Frozen shoulder is also known as adhesive capsulitis. It is a medical condition characterized by pain and stiffness of the shoulder joint, as well as limitations of the range of motion. 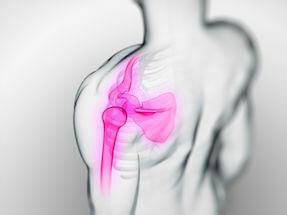 Frozen shoulder is more common among people over the age of 40, which develops gradually. The tissue of the shoulder joint tends to become thicker and tighter, while the scar tissue develops over the time as well. This will eventually result in smaller motion range of the shoulder, swelling of the joint, pain and stiffness. People who have diabetes, hormonal imbalance or a weakened immune system due to different medical conditions are more likely to develop frozen shoulder. Being inactive for a long period of time, like after a surgery, injury or an illness that requires bed rest, makes you more vulnerable and increases the risks of having a frozen shoulder. Normally the joints in a human body are surrounded by a capsule of connective tissue. When this capsule thickens and tightens around the joint, the movements of your shoulder will be restricted, leading to frozen shoulder. The signs and symptoms of frozen shoulder usually tend to develop over a long period of time, worsening as the time passes. First the movement of the shoulder starts to cause pain, while the range motion of the shoulder starts to become limited. As the time passes, the shoulder becomes stiffer and the range motion becomes even more limited. Moving the shoulder less and less will just make this condition worse because it increases its stiffness. Eventually, doing daily tasks becomes hard or even impossible, like reaching things from high shelves and even dressing. During the last phase of this condition, the range motion of the shoulder joint starts to improve. Once you experience any problem with your shoulders, you should seek medical help. A detailed medical examination will allow your doctor to observe your motion range of the shoulders and if necessary further tests like X-ray of the affected shoulder, CT-Scan and even MRI are performed. Sometimes an Arthrogram is also necessary, which includes injection of a dye followed by X-ray of the shoulder in order for your doctor to see its structures. The goal of the treatment in cases of suffering from a frozen shoulder is controlling the pain and preserving as much as possible the range of motion of the affected shoulder. Over the counter pain killers are usually enough to control the pain, which also help reduce the inflammation. In some cases stronger pain killers and even anti- inflammatory medications are prescribed. Physical therapy is another treatment option which will help you recover the range of motion as much as possible. Doing these exercises as told by your physical therapist is very important for your recovery. Most of the frozen shoulder signs and symptoms tend to resolve on their own within one to three years. However, in persistent cases joint distension, steroid injections, shoulder manipulation and even surgery are necessary. Diabetes is one of the causes of frozen shoulder, so maintaining normal glucose levels in the blood may also help prevent this condition. Immobility for a long period of time due to different reasons like illness, a broken arm, etc., is one of the main causes of frozen shoulder. Try to do as much exercises as possible in order to maintain a normal motion range of the shoulders.